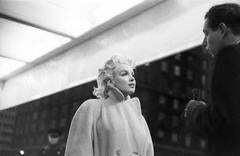 'Marilyn Takes It To The Streets' Movie star Marilyn Monroe is seen in a candid moment on the street in March 1955 in New York City, New York. This image epitomises the classic Hollywood glamour and style of 1950's era. (photo by Ed Feingersh) A beautiful silver gelatin fibre darkroom print - made directly from the original negative held at Archive source. 12 x 16" inches / 31 x 40 cm's (paper size) Galerie Prints Emboss Stamped & Hulton Getty Archive London issued Limited Edition 1/300. We ship regularly using Fedex Express services and shipping to all international locations is complimentary. A beautiful silver gelatin fibre darkroom print. Galerie Prints Emboss Stamped &amp; Hulton Getty Archive London issued Limited Edition 1/300.